Chronicle of the Years of Fire (Arabic: وقائع سنين الجمر‎‎, translit. 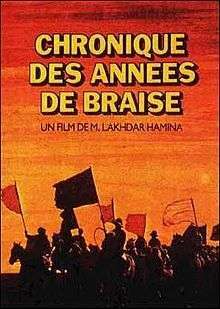 Chronique des Années de Braise) is a 1975 Algerian drama historical film directed by Mohammed Lakhdar-Hamina. It depicts the Algerian War of Independence as seen through the eyes of a peasant. ↑ "Festival de Cannes: Chronicle of the Years of Fire". festival-cannes.com. Archived from the original on 2012-09-26. Retrieved 2009-04-27.